The other evening we went to a Latin Fusion restaurant called “Catharsis“, where we alway’s enjoy a great meal. As we walked in the hostess were sampling this bottle as they had just gotten it in stock. The owner knows how much I love good quality wine and he suggested it to us. Now this bottle reminded me of what a great Spanish bottle of wine should taste like. From one of my favorite regions where they are known for producing great quality wines “Ribera del Duero” with so much history dating back to the 16th century. Aromas of delicate lavender and violets, soft mouthfeel, plums, dark fruit, leathery notes, elegant, nice lasting finish, moderate to full-bodied. Wonderful bottle for the price, great value. I paid $49 in restaurant. 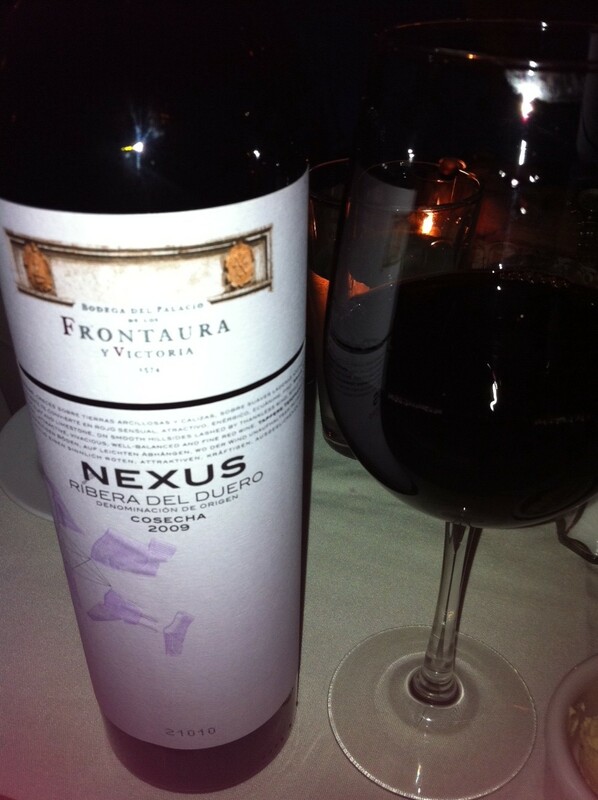 We had a great meal, enjoyed the wine while listening to latin music, nice evening! This entry was posted in Spain, Value Wines and tagged Catharsis Restaurant, great value, Latin fusion, Ribera del Duero, Spain, Tempranillo. Bookmark the permalink.